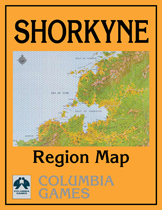 The Shorkyne region in northwest Lythia lies between the Sea of Ivae and the island of Hârn to the west, Trierzon to the south, Ivinia to the north, and Quarphor to the east. 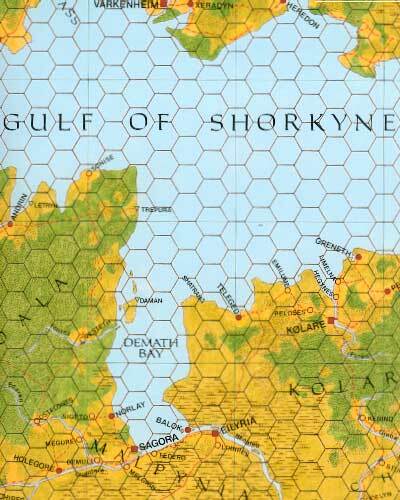 The region is dominated by high mountain ranges and fertile river valleys and includes all or part of the kingdoms of Shorkyne, Chelemby, and Harbaal, and the petty fiefdoms of Hurisea. This colorful 22 34-inch map shows the roads, vegetation, and topography of the region and is dotted with hundreds of castles, cities, and other points of interest. Note: This map is included in the Shorkyne module. Close up view of a section of the map.